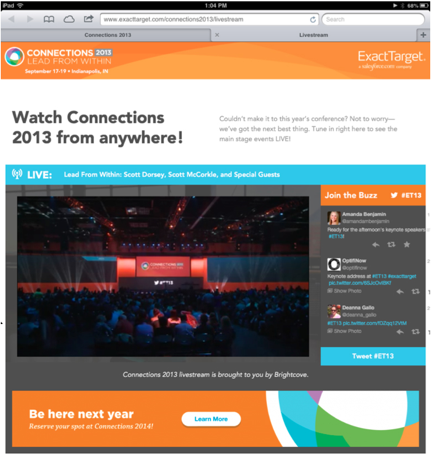 I was recently fortunate enough to be on-site as Brightcove Video Cloud Live powered the live stream for the sold-out ExactTarget Connections 2013 Conference. Because I was eager to witness first-hand the execution of such a large-scale live stream, I made it a point to watch all delivery aspects of the event, both live and via the video on-demand (VOD) archives. It was a prime example of how to successfully stream an event, and I thank the ExactTarget team for allowing me to recap their successes here. 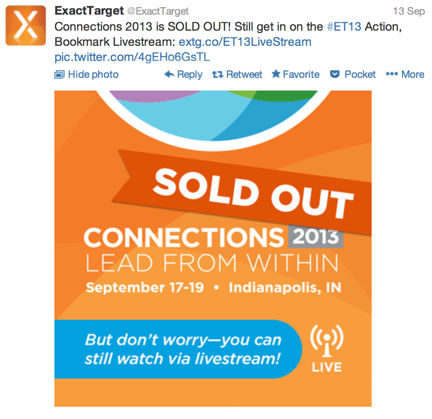 Days and weeks leading up to the event, the ExactTarget team promoted the live stream both on their website and social media channels, giving it plenty of visibility and ensuring that the remote audience for the conference was vast. From a configuration perspective, the event was driven by a series of MacBook Pros with capture devices and Wirecast as the on-location encoding for the source stream. That single stream from Wirecast was sent to the Brightcove Video Cloud Live module, where it was transcoded into outputs optimized for desktop computers, tablets and mobile phones. 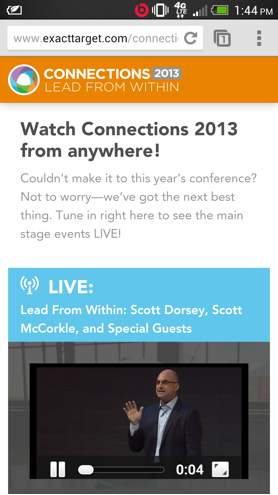 From the user experience standpoint, roughly 15 minutes prior to the event, the live stream from the venue began. This lead-in time was built into the live event to ensure that all connections were in sync. 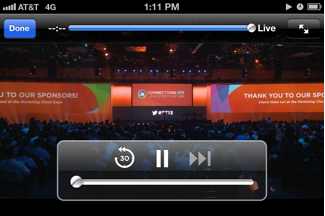 It also provided the Web viewer a "sense" of what it might be like to be at the venue. At the same time, the early feed start helped the live event team to reaffirm that the stream was running smoothly. 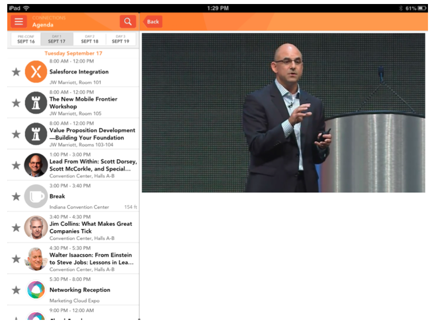 Once the event began, viewers from around the globe had an opportunity to view the live stream via numerous destinations on the Web and mobile Web: the conference homepage, the iPad app, the iPhone app and an Android app. For those who couldn't attend the conference in person, there was no reason not to catch the live stream! And for those whose schedule couldn't allow them to catch the live stream, within hours of the conclusion of each event session, archive files were posted for viewing on the Connections website. Each VOD asset was clearly labeled and social sharing cues were prominent. You can continue to access and enjoy the conference sessions via the VOD portal here. 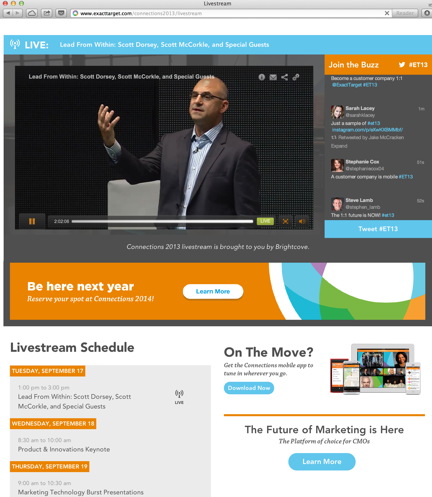 Have you seen any other great examples of live stream delivery recently? I'd love to hear from you in the comments.